The Windham Eagle athlete of the week is senior Tyrell Gullatt. The 18-year-old is a football player at Windham High School. He lives with his mother, father, sister, two dogs and a pet snake. He plays guard and defensive tackle on the football team. His hobbies include “working out in the weight room.” His football hero is Patriots player Vince Wilfork. “I’ve found a way to play sports and get all of my work done without a problem,” he said on the sports and school balance. On the topic of teamwork, Tyrell said “No matter what situations arise, with teamwork, you can overcome overwhelming obstacles. In the future, Tyrell hopes to attend college with a major in business and one day manage his family’s business. Riding a wave of momentum after solid victories over Thornton Academy and Edward Little, the Windham Eagles football team ran into a tough Bonny Eagle team last Friday. The Scots utilized a balanced attack of running and passing in a 33-13 defeat of their longtime rivals. Early on the game was evenly matched and Windham even drew first blood. Junior quarterback Desmond Leslie connected with junior running back Cam Hoffses on a 30-yard pass setting up a first-and-goal midway through the first quarter. Senior running back Griffin Jacobson punched the ball into the end zone and the Eagles were up 6-0 after a failed two-point conversion. Soonafter, a thundering hit by senior defensive lineman Tyrell Gullatt caused a Bonnie Eagle fumble that was recovered by Windham late in the first quarter, but the Eagles couldn’t capitalize. In the start of the second quarter, the Scots connected on their own long pass play for a touchdown and after the extra point attempt was good, the home team led 7-6. After both teams traded possessions, Windham freshman defensive back Blake Houser picked off a Scots pass, but again the Eagles couldn’t capitalize. Jacobson came on to punt and Bonny Eagle took the return to the end zone for a touchdown and subsequent extra point for a 13-6 lead. Penalties at the wrong time put the Eagles in third-and-long situations that were hard to convert and they went into halftime trailing by a touchdown. At the start of the second half, Windham received, but went for it on fourth down and came up short, giving the Scots the ball. That didn’t last long because Jacobson and senior defensive end Kyle Kilfoil punished a Bonny Eagle runner, causing a fumble. Houser was there to take advantage and he ran the ball into the end zone. With 10:04 left in the third quarter, the score was tied. On the ensuing kickoff, the Scots fumbled the ball, but retained possession. Neither team could maintain a sustained advantage until at 4:11 in the third quarter, the Scots completed another long pass and run to go up 19-13. Windham attempted to make one last stand when Hoffses clobbered a Scots runner at the goal line, but on the next play, Scots quarterback Cam Day scored on a keeper, putting the home team up for good 27-13 on senior night. The Scots kept their collective foot on the gas, scoring once more for good measure with 3:36 left in the game for the final score of 33-13. The Eagles hope to get back on track when they host Oxford Hills this Friday at 7 p.m. The final game of the Eagles’ regular season and senior night will be Friday, October 23, when the team hosts arch-rival Cheverus. 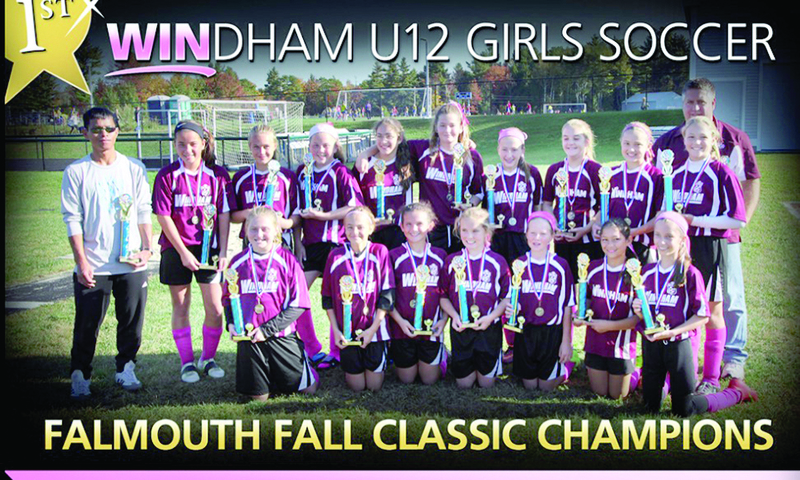 The Windham YSA U12 girls lead by Coach Ram Tray have won their second tournament championship this year, winning the 2015 Falmouth Fall Classic Tournament over Columbus Day weekend. 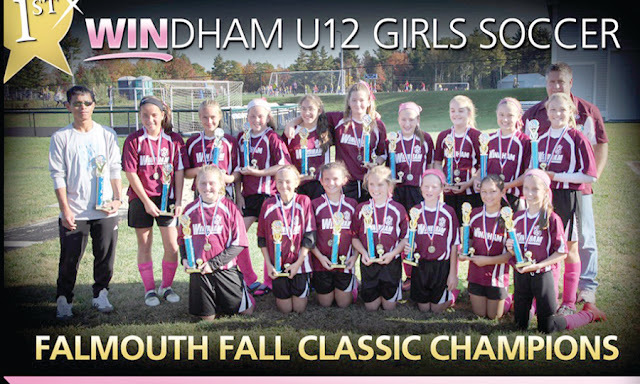 Windham, changing their uniform socks to pink in recognition of Breast Cancer Awareness Month had victories over Waterville 5-2, Yarmouth 7-0, Falmouth 4-0, and Gorham/Sherry 4-1......before beating Gorham/Chouinard 2-1 in overtime to be crowned tournament champions! 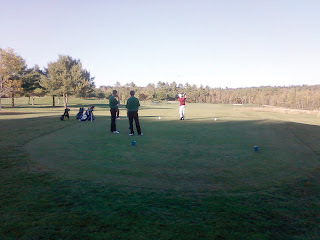 The girls are now preparing for the Maine State Fall Classic League Playoffs on October 24th. The Windham Eagles golf team enjoyed a successful regular season, with eyes now on the state tournament. Carrying a senior-heavy team, Coach Adam Manzo relied on co-captains Alex Spiller and Jack Blake to set the tone for Windham all season long. Spiller, who had a 39.3 average in matches, also beat the defending Girls State Champion, Hashilla Ravai, which was her only loss in the last two years. Ably backing up the captains were seniors Bryce Rolfe, Zack Hough, Connor Daigle and Tyler Johnson. They played in all ten matches, and five of the six shot sub-40 rounds in a match. 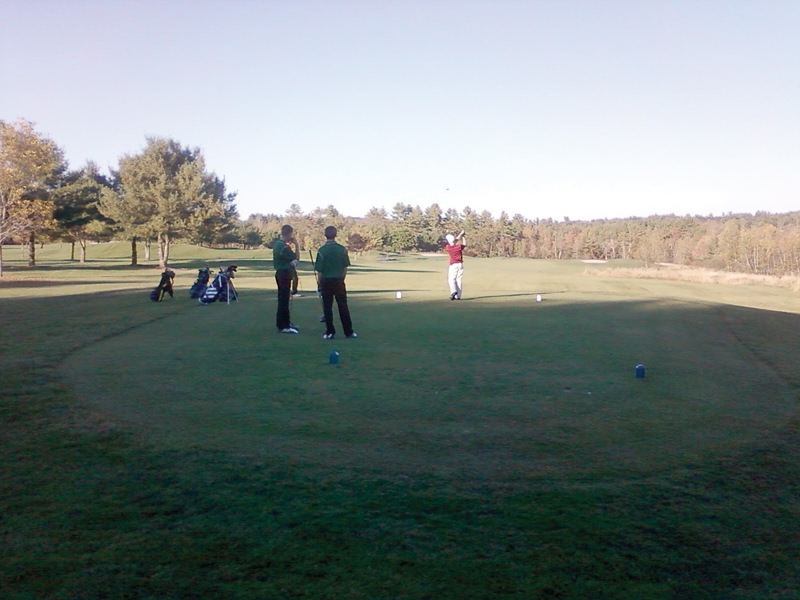 Last Monday the Eagles traveled to Vassalboro for the SMAA Team/Individual Qualifier, which was played on the Tomahawk Course at Natanis. "We ended up shooting a 332, (keeping four of five scores from Spiller, Rolfe, Hough, Johnson and Blake), which was good enough for fifth best that day, earning us a spot in the Class A State Championship this Saturday, October 10, at the Tomahawk course. We were led Monday by Tyler Johnson, (holed out for eagle on the par 4 fifth hole), who shot an 80, and Zach Hough who shot an 81, (birdied his final two holes). Both Johnson and Hough also qualified to play in the SMAA Class A Individual Schoolboy Championships, which will be held on October 17, also on the Tomahawk course," said Manzo. Windham's success during the regular season, and good showing at the qualifier have them poised to turn some heads at states. Coach Manzo has had this recipe brewing for a while now, and the program is delivering with great results. Manzo is in his sixth year of head coaching the team, seventh overall. "This season was a culmination of four years worth of constant improvement. It was a season of firsts for our program. We started off the year with close to 30 kids signed up for golf. A number I never could have imagined four years ago when we only had around 12. It was the first time we finished the season with a winning record in six years. Finally, and most importantly, it marked the first time this team from this school qualified to play for a state championship. Our goal all season was to be good enough to qualify as a team, as well as send several kids off to individuals, (SMAA Qualifier), and we have been able to achieve that. Now we're starting to focus our attention on actually winning a state championship, something this group is certainly capable of doing. I could not be happier for these kids. They have really worked hard to make themselves and this team relevant," he said. The Windham Eagles traveled to Auburn to face off against Edward Little’s Red Eddies last Friday night at Walton Field. Walton field is small in size and as a spectator you have the feeling of being on the field with the players. As the Eagles and the Eddies started the game you sensed both teams were ready to play the game of football. The Eagles (4-1) didn't make many mistakes and managed to play well despite a number of injuries currently on the team. The Eddies however couldn’t seem to come back after committing several errors during the game. Edward Little despite having home field advantage seemed to make error after error. After Windham’s first touchdown the Eddies made a minor error fumbling the ball, however they recovered it and ended the first quarter of the game slightly down. The second quarter only seemed to get worse for the Eddies. When Edward Little went to punt the ball, the Eagles Hebert not only blocked the punt, but caught it and returned it 24 yards for the score. On the next punt, Hebert blocked it again. Bernier recovered it and returned it 21 yards for a 28-0 lead for the Eagles. Edward Little (2-3) fumbled the ball three times in the first half and had one interception. The Eddies also had two blocked punts which were returned for touchdowns as Windham scored 35 points in the second quarter. "It was great," Windham coach Matt Perkins said. "When you win that third phase of the game, the special teams, and have two blocked punts for touchdowns and you strip a ball on a kickoff, when you do that stuff, things are going well." Junior back Cam Hoffses rushed for 172 yards on 20 carries and had a touchdown. Quarterback Desmond Leslie rushed for two touchdowns and threw for another. Windham finished with 251 yards rushing on 37 carries while throwing for 33 yards on two completions. "When you can execute like that, the kids have really bought into special teams," Perkins said. "We make that a very big part of our week. Every game that we've won has had a lot to do with special teams." The Eagles will travel this Friday to face the Bonny Eagle Scots, game time 7:00 p.m.